Grace. Love. Peace. Faith. Joy. During the years 1879 – 1884, seven families and two single young men from the area of Hunteburg, Hanover, Germany settled in the Robinson area. These people, along with two families who moved from Indianapolis, Indiana, formed the nucleus of St. John’s church at Robinson. In 1884, Rev. Christian E Schaer, pastor of Zion Church, Waco, led in the formation of an Evangelical congregation, a part of the German Evangelical Synod in North America. The name “German” was dropped from the synod title in 1927. 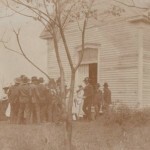 During the early years, worship services were held in the homes of members. When the members of the local Presbyterian church offered the use of their building, our members gladly accepted the offer. This arrangement resulted in a relationship that continues to this day – we gather yearly for combined worship services. In 1890 we built our first place of worship, replacing it in 1906 with our second church building which included a 52-foot steeple. The present church building was constructed in 1952. Our first resident pastor, Rev. John Strauss, was called in 1900 and served the congregation as teacher and spiritual leader for 40 years. Because Rev. Strauss had his own home, no parsonage was necessary. But with his retirement in 1940, a need for a parsonage was realized. The first parsonage was constructed in 1941 and was replaced in 1963 when a four-bedroom parsonage was completed and dedicated. Since the tenure of Rev. Strauss, several other pastors have served the flock, providing stable growth for the congregation. We are grateful for the leadership they provided. While worship services were originally conducted in the German language, the final German language service was held on Good Friday, 1959. As of October 2008, we have entered our 125th year of life. Let’s look at what it took for the founders to have a church building for St. John Church. It was good to be able to use the Presbyterian Church building for worship services, but the congregation wanted to have their own church building. This desire grew and, under the able leadership of Pastor C. Lengtat, the congregation began working toward making the dream become a reality. Members of the church gave to a fund for a church building. Collections were made. Loans from 3 individuals in the total amount of $400.00 were made at 6% interest. Heeding the advice of John Strauss, who later became the first pastor, the congregation looked for land in the Village of Robinson. With funds to use, the congregation was able to look seriously. Dr. John Scott Tate (1842-1920) of Missouri, had come to Texas in the fall of 1868. He first settled at Mooresville where he practiced four years, moving to Robinsonville in 1872. He remained here until 1883, when he moved to Coryell County and settled on a ranch. In 1888 he returned to McLennan County and re-established a practice at Robinsonville. His wife was a member of the old-school Presbyterian Church. Dr. Tate.s brother, James T. Tate (1849-1903) also moved to Texas and was a builder. The land on which the church was built – lots one and three of Block 13 in the town of Robinsonville – was deeded to Christ Rueter, Wm. Schaeper, and C. Lengtat, trustees of St. Johns Church of the German Evangelical Synod of North America by J.T. Tate by Warranty Deed dated December 7, 1889. Mr. Tate was paid $100.00 for the land. J.T. Tate also served as contractor in the building of the church structure, for which he was paid $597.00. Completed in 1890, the building, 22 feet wide and 36 feet long was completed largely by the use of volunteer labor at a total cost of $754.80. The congregation now had their own church building. One of the streets in Robinson bears the name of Tate. The years passed. The congregation grew. During the years 1884 to 1904, 14 marriage ceremonies were performed, 66 infants were christened, and 24 young people were added to the membership rolls of the church through the Rite of Confirmation. Their first church building that had been constructed in 1890 was serving the people well. Rev. John Strauss became the first settled pastor for the congregation in 1900. He provided stable, inspirational leadership for the group of believers. The membership rolls grew, resulting in the need for more space – a larger building. The size of the first church building no longer was sufficient for the number of worshippers. The congregation had out-grown the building. A decision was made to build a larger church building. Thus, in 1906 a Building Committee was formed. The members were: Henry Schaeper, William Schaeper, Henry Frese, Henry Staas, William Staas, Herman Rueter, William Kettler, and Jno. Strauss. Articles of Agreement were drawn between the German Evangelical St. Johannes Church of Robinson and the Contractor, J.E. Johnson of Waco, to construct and erect and furnish all materials for the building of a one-story frame structure in accordance with the plans and specifications furnished for the same by Milton W. Scott, Architect, of Waco, Texas. Milton Scott (1872 – 1933) had built a reputation as a master architect. Waco landmark buildings that he designed include the Clifton House, First Baptist Church, the Hilton Hotel, Palm Court, and Waco High School. He also designed the old Cotton Palace pavilion and the Artesian Bottling Company building, now in use as the Dr. Pepper Museum. He designed the second Temple for Rodef Sholom, a beautiful house of worship. 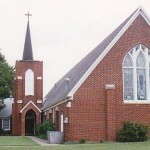 The cost of the construction of this second church building was $2,500.00. The building was 32´ wide and 52´ long with a steeple 52´ high. The steeple held a 500-pound bell presented to the church by Mr. H. Kinderman, father of Mrs. Herman Quinius who was the sister-in-law of Mrs. John Strauss. This bell was cast by the Hy. Stuckstede Company of St. Louis, Missouri and was then shipped to Texas. The bell, which was used to call the congregation to worship in their new church building, continues that function today. From the years 1907 to 1914, 13 marriage ceremonies were performed, 52 infants were christened, and 42 young people were added to the membership rolls of the church through the Rite of Confirmation. The larger church building was certainly appreciated. These were busy years. Rev. Strauss was a diligent, dedicated shepherd to his flock. And his flock grew. During this period of time, there were 60 christenings including 4 done in Elm Mott for the Neumann family (Herbert remembers the day). The parents and sponsors promised to “bring the child up in the nurture and admonition of the Lord.” There were 51 confirmands, 17 marriages, and 19 deaths. In addition to his duties as Pastor of St. John, Professor Strauss was kept busy with the Academy. The words of Reverend Frank Horak, Jr. give us insight into the importance of the Academy: “The role of the Academy in the life of the Texas District of the Evangelical Synod should never be forgotten. The lifeblood of a church rests solidly on the ministry of the church. Robinson Academy was the training center for several ministers who became leaders in the denomination. Public school education usually went up to the 8th grade in rural communities. Continued education had to come from elsewhere. Robinson Academy was accessible and available to many central Texas communities and Robinson residents made rooms available to students from surrounding communities. In the year 1922 the operation of the Academy was taken over by the Evangelical Synod of North America. This decade was begun with a building project. In 1924 a hall for church school, meetings, and social purposes was erected. There were partitions on casters that could be moved where needed to provide separate areas for Sunday school classes to meet. Vacation Bible School was held in this building and the porch was used for craft projects. It was a very handy building to have. On December 16, 1927 incorporation papers were completed for Evangelical Saint John’s Church at Robinsonville, Texas. Also in 1927 the name “German” was dropped from the Synod title of “German Evangelical Synod of North America”. We were becoming more and more a part of the American way of life. November 25, 1928 a fire destroyed the Robinson Academy building. The school continued for a time and then closed permanently. And on June 20, 1929 Texas Power and Light Co. brought electric power to Robinson. For a $3 deposit and a $1 fee, electric service was brought to St. John’s Church. On February 3, 1931 a Right of Way Deed from Evangelical St John’s Church of Robinsonville to the County of McLennan allowed space for a public street for $24 on the western edge of the property. 80 christenings, 56 confirmations, 46 marriages, and 28 deaths occurred during this decade. Rev. Krueger was a busy man. The congregation of St. John church continued to grow. Rev. Krueger performed 18 christenings and 3 adult baptisms. During his time 49 members were added to the church rolls by the rite of confirmation, 24 marriage ceremonies were performed, and there were 15 deaths. In 1948, Rev. Krueger answered a call to ministry in Newton, Kansas which resulted in the Rev. Carl H. Kluge arriving with his wife in November to become our third settled pastor. Rev. Kluge had a vision for St. John that resulted in a decision to build a new church structure in 1951. 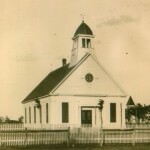 The existing church building, built in 1906, would be torn down and replaced. Preparations began. On October 7, 1951 a motion was made, seconded, and carried that the Church Council be empowered to carry out plans for the construction of our new church being governed by a building committee. On December 5, 1951 a motion was made and carried that we give our approval to the committee report and pledge our support. The Trustees were: A.W. Staas, President; W.G. Peplow; John Ashleman, Secretary; H.T. Neumann, Treasurer; Wesley Grube; William Kettler; and John Koerth. February 10, 1952, at the age of 99 years, 4 months, and 28 days, Rev. John Strauss passed from this life. He came to Texas for his health and had a long life here. The dedication of the third church structure for St. John’s church was celebrated on August 31, 1952. On April 1, 1953 Rev. Kluge resigned his pastorate with St. John and answered a call to ministry in Kyle, Texas. During his time with us he performed 47 christenings and 5 adult baptisms; there were 38 confirmands, 14 marriage ceremonies, and 17 deaths. He was replaced by Rev. Theo F. Schumacher who, with his wife Evelyn, arrived on July 17, 1953 to become our fourth settled pastor. Rev. Schumacher was the pastor we needed. Due to his untiring efforts, the membership grew and the debt incurred in the building of our church was liquidated. In 1955, Zion Church of Cottonwood was dissolved and the membership, with privilege of transfer elsewhere, was absorbed into our congregation. About twenty members were added to the church rolls as a result. 1957 the Evangelical and Reformed Church united with the Congregational Christian Church and became the United Church of Christ with the theme “that they may all be one”. The Good Friday service in 1959 marked the final service conducted in the German language at St. John. April 1959 Rev. Schumacher leaves having performed 82 christenings, 27 marriages, 31 funerals, and confirming 21. August 1, 1959 Rev. Fred J.W. Weltge arrives to become our pastor. November 16, 1962, a deed from Bertha Rau Strauss and John D. Strauss to St. John’s United Church of Christ set in motion a building program on land located directly across the highway from the church. The building program ensued and on May 26, 1963 the new parsonage was dedicated. The anniversary service held on October 25, 1964 celebrated our 80 years of life as a church. Rev. Carl Burkle, South Central Conference Minister, gave the sermon at the morning service with Rev. Carl H. Kluge returning to Robinson to give the afternoon sermon. The Senior Choir and the Junior Choir performed musical selections. Virginia Wuebker was organist for the morning service with Jean Kettler playing the organ for the afternoon service. Rev. Weltge, our fifth settled pastor, was a true shepherd to his flock, watching over all with care and concern. He, his wife Ruth, and their children Ingrid and Arlo were the first family to occupy our new parsonage. These were quiet years − growing years. The church building was recently built, the parsonage was newly built. Rev. Weltge was able to concentrate on his “flock” and the congregation flourished under his pastorate. A display case to be used in the Narthex, an outdoor church sign, and a cross made of oak listing the pastors who had served St. John were added in 1974. The celebration of 90 years of life as a church was held on October 27, 1974. Rev. James Tomasek, South Central Conference Minister, gave the sermon at the morning service, “Celebrating the Christian Community” with Rev. Theo F. Schumacher traveling from Evansville, Indiana to give the sermon for the 3pm afternoon service, “Can Your Gods Be Stolen?”. The Senior Choir performed “Cherubim Song” during the morning service, and a duet of Ann Groppe and Doris Rasner performed “In A Quiet Moment” during the afternoon service. Jo Ann Brown was organist with Virginia Wuebker as pianist for the morning service. For the afternoon service they switched with Virginia at the organ and Jo Ann at the piano. The paneling in the Chancel was completed in 1975 along with a flower garden. Two 9″x4″ wooden crosses were made and installed above the doors leading to the Chancel in 1977. Playground equipment and fence were acquired in 1977 and a hedge was planted between St. John’s property and that of First Baptist Church. In 1978 a Roper kitchen range was purchased. Rev. Weltge continued as pastor during this decade. These were busy years with a concentration on people and improving our property. A rose garden was added on the north side of the church in 1979. Mid-way through the decade, the 95th anniversary celebration happened on October 14, 1979. For this service, Rev. Schumacher returned again from Evansville, and spoke on the subject “The People Who Have Passed the Ball to You”. The Senior Choir performed “If My People Will Pray” and “Here Am I, Send Me” and the Junior Choir sang “O How He Loves Me”. A basket dinner was enjoyed at noon followed by a 2:30 afternoon service during which Dwight Forbis provided a solo, “Amazing Grace”, accompanied by Melinda Nichols. The Rev. Edwin Mehlhaff, Associate Conference Minister spoke at the afternoon service. Jo Ann Brown was at the organ and Virginia Wuebker was at the piano both services. In 1982, having outgrown the original kitchen, the stage area in the assembly room was converted into a kitchen, and the original kitchen be-came a library. Also in 1982, St. John was registered with the Texas Historical Society and received a plaque; white, purple, and green paraments for the chancel were given, in addition to a trophy case. In 1983 portraits of our pastors were framed and given to St. John to be displayed on the wall. 1984 our centennial year! The founding of St. John church 100 years previously was celebrated in a manner befitting that many years. Two services were provided. For the morning worship service, Jo Ann Brown was organist and Ronda Kirk was pianist. Ronda Kirk sang “My Tribute” and Rev. Edgar Krueger provided comments and prayer. The sermon “A Place and A People” was given by The Rev. Edwin Mehlhaff, Associate Conference Minister. Ted Neumann and Cynthia Sykora sang “Fill My Cup, Lord”. Following a catered meal, the historical marker was dedicated. At the 2:30 anniversary service, Ann Groppe was at the organ. Karen Groppel sang “We Shall Behold Him”. Larry and Marla Overstreet sang “There’s Something About That Name. Rev. Paul Kluge provided comments, Martha Kettler presided over the Confirmation Roll Call and recognized guests. The Overstreets sang “Father, Lift Me Up” and Rev. Ernest Dean, Jr, gave the sermon “In Search of Truth”. This was a grand occasion and well attended. Following is Rev. Weltge’s report that appeared in the newsletter. “Over 400 Centennial Invitations were sent out; requests received for noon meal reservations were 523; to allow for extras we contracted with Clem Mikeska’s B-B-Q for 525 @ $4.50 each. Total served, 434, but we paid for the 525 contracted, $2,362.50. We wanted to allow for extras rather than be short…The Morning Worship attendance, 476; not all stayed at noon, but others came who had not been able to be in Worship… The ushering was great!… Mr. W.O. Schnizer and committee did a beautiful job in arranging flowers around the altar, corsages, carnation at each table, the colorful arrangement around the Historical Marker… Other flowers: Altar centerpiece (daisies and blue carnations) for John/Wilma Westbrook’s 30th Wedding Anniversary; white Mums beside Lectern and Pulpit, Mrs. Meta Hartwick; Mums from Dr. Jack and Barbara Kilgore “Congratulations on a wonderful one hundred years of service in the area. Our best wishes for the years to come”; Arlo and Janet Weltge (in Memory of our aunt, Sister Clara Weltge and her grandfather, Alvin Macheledt); a silk flower arrangement from the family of Herman Rueter; a silk pole ivy in memory of Bill and Ella Rueter by the children…Thanks to Mary Lou Jahnke for the sketch of three Church buildings used on the Invitations and the Centennial Bulletin…Paul and Mildred Kunze for video taping the service… Mrs. Lewis Brown for permitting use of her property for extra parking (Randy Wegwerth for mowing the area)…Martha Kettler for Historical Room arrange-ments…and Jeannette Nehring for Centennial Plates”. In 1985 Rev. Weltge retired from active ministry and he and Ruth moved to the hill country. He was followed in 1986 by Rev. Ron Krueger who arrived with his wife Sue and their sons. In 1989 racks for Bibles were added to pews in memory of Henry Kahanek and Bibles for the pew racks were given in memory of Erna Kunze by her husband and her children. In 1993 a new covered entrance for the Narthex was added and a Baldwin piano was purchased for use in the Assembly Room using proceeds from a craft sale. Early in this decade, Rev. Ron Krueger answered a call to ministry in Spring, Texas. He was followed in St. John’s pulpit by the arrival of Rev. Frank Horak who served as interim pastor while we looked for a full-time pastor. Rev. Horak looked around the church and found things that we could do to improve the church building. The projects that we entered into included carpet for the rooms and folding chairs and round tables for the assembly room. Then we acquired a 12′ conference table and 14 maroon arm chairs for meeting use. We added Confirmand/Acolyte robes and an eternal light for the Chancel. We looked at the Pastor’s Study and re-covered the couch and chairs there. All of this occurred in 1995. Rev. Horak came up with many things for us to do and coined the phrase “the church at the rise in the road”. December of 1995, Rev. Larry Bünger arrived to be our next settled pastor. He served us until his health failed. January 2002, Rev. John Will arrived to serve as interim. Our Search Committee worked diligently and found Rev. Robert Workman to serve as our next settled pastor. He arrived in August 2002. He served until November 2003 when he left the St. John pastorate. This brings us to the most recent five years of blessings this church has enjoyed. The Looking Back project will be completed in next month’s newsletter. Rev. William Mulford arrived in March of 2004 to serve St. John as an Intentional Interim Pastor. He brought a lot of energy to the position of pastor. He authored the bulletin and experimented with various formats for it. While he was here, we bought a new printer so that we are able to do print jobs ourselves. He served until June 2005 when Tammy Wynn filled our pulpit for several months. We relied on retired U.C.C. pastors, students at Baylor’s seminary, and local pastors for pastoral service for several months. Rev. Kathy Fox filled our pulpit for many of those Sundays. January of 2007 Pastor Glenn Kramer, a retired Lutheran pastor, filled our pulpit until August 2007 when Rev. Toni Kracke, a recent Eden Seminary graduate, arrived with her husband, Kermit, to become our next settled pastor. During these last five years, we have added Veteran’s Plaques, a bench for the playground, the UCC emblem for the sanctuary, hearing assistance devices, 4 benches for the north rose garden, and banners.